I wish it was with happier news that I was writing this morning about the results of the 56th Regata Storica delle Reppubliche Marinare that took place in Venice yesterday. No, I’m not sad that Amalfi didn’t win, or came in a close second like they did in 2009 and 2010. I’m disappointed to have to report that everyone lost yesterday, in what will likely be remembered as one of the worst regattas in the fifty-six year history of this event. As the race was run, and by all accounts in Venice, the Amalfi team won. The team had a fantastic race, managing to pull ahead of the favored team Pisa to win by a photo finish. Surprisingly just like how Pisa won last year. Unfortunately, there were problems with the course that were contested, and problems with the Pisa team being remarkably poor losers. (They should have taken a lesson from the Amalfi team that lost by a similarly small margin last year, but in a much more respectable way.) But the more serious problems were the issues with the course. Even though Amalfi was announced the winner, it wasn’t long before not only Amalfi’s win but also the positions of the successive Pisa and Genoa teams were contested. Apparently, it was said by the Venice team that came in last, that they were the only ones that stayed on course and that the other teams should be disqualified. And that is exactly what happened. 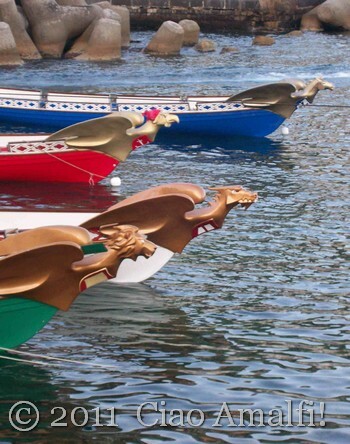 After nearly two hours of tension, meetings with the judges and the mayors of Amalfi, Pisa, Genoa and Venice, it was decided that the only result that could not be contested was just to annul the regatta. What a shame. I don’t understand in detail yet just what happened with the course or the buoys or the judging, but it seems like that is where the real problems are. My hope is that something positive can come of this in taking better steps to organize the event. 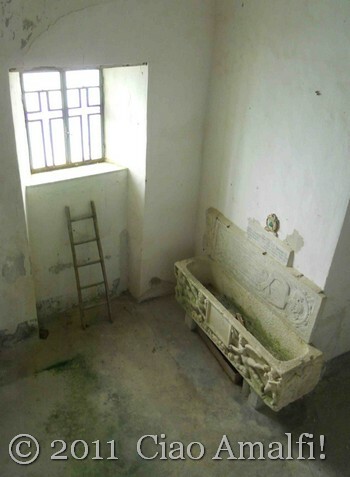 And I also hope that a shadow won’t be cast over this event, which is supposed to represent the high points in the history of each of the four great sea republics of Italy. 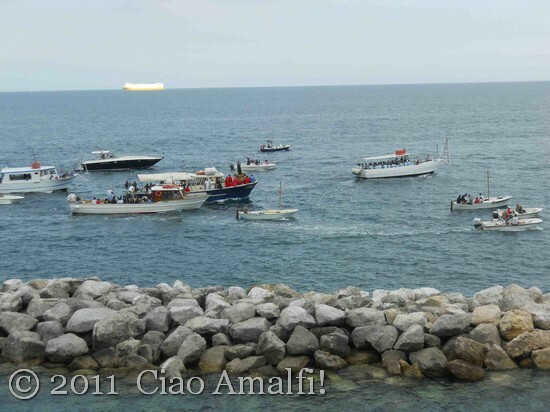 The online newspaper Il Foglio Costa d’Amalfi has covered the event in great detail, and published an article this morning focused on who really won and who lost at this year’s regatta. (It’s in Italian, but there are videos at the end from the RAI 2 TV coverage.) They expressed disappointment that this type of debaucle had to mark the year that Italy celebrates its 150th anniversary. It is disappointing. But what is the most disappointing to me is that the all teams have to walk away from the regatta with such a bad experience, after a year of very hard work. I am sad for the Amalfi team that has been practicing so hard all winter and spring and had an excellent race yesterday. The Regata Storica delle Reppubliche Marinare is in Amalfi next year, but I’m afraid that the bitter feeling left from this year’s regatta in Venice will likely hang over the event for many years to come. 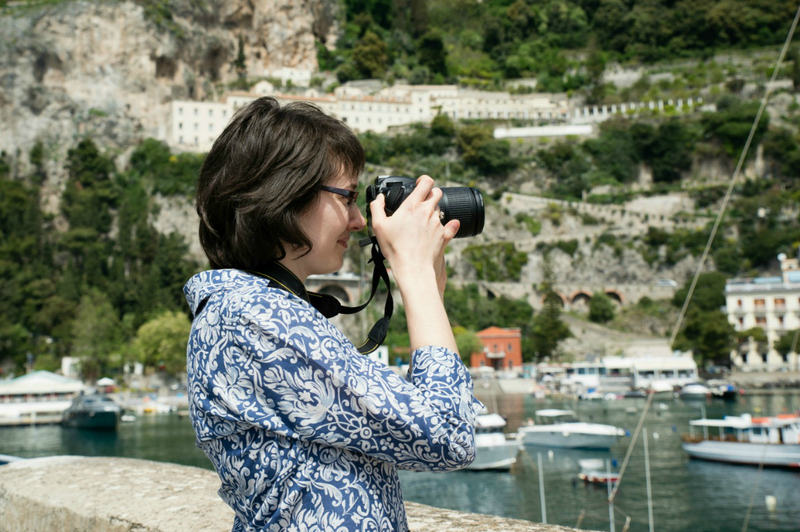 June has arrived … and it’s summer on the Amalfi Coast! 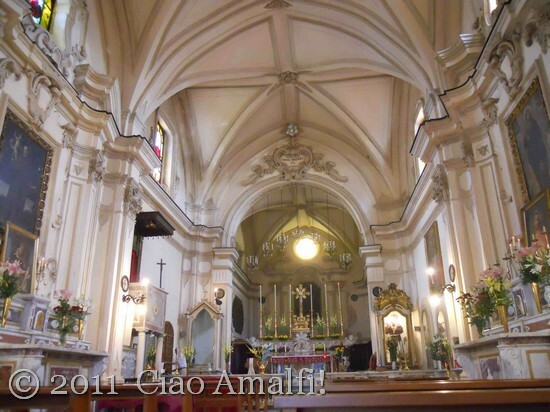 If you’re planning a trip to the Amalfi Coast this summer, here is a list of some of the best religious festivals from June to August. 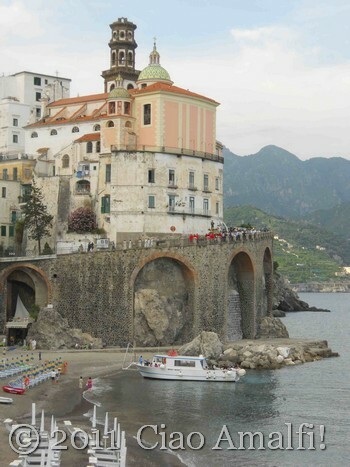 Even if you’re not Roman Catholic, timing your holiday on the Amalfi Coast to coincide with a religious festival offers you the chance to experience the excitement, the religious traditions and celebrations that take place each year in the small towns of the Amalfi Coast. Or, if you’re looking for a quiet escape, you’ll want to avoid these holidays as they attract large crowds, create parking nightmares and a lot of noise. (Think booming fireworks at 7am.) But, if you’re like me, you’ll love a good festa and the chance to experience something truly Italian! 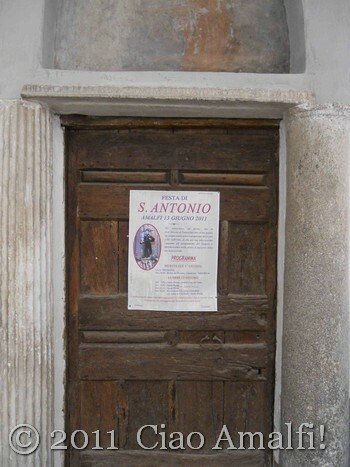 The beginning of the summer season of religious festivals on the Amalfi Coast starts with the Festival of Sant’Antonio (St. Anthony) in Amalfi. This festival has one of the most elaborate religious processions that I’ve seen on the Amalfi Coast. 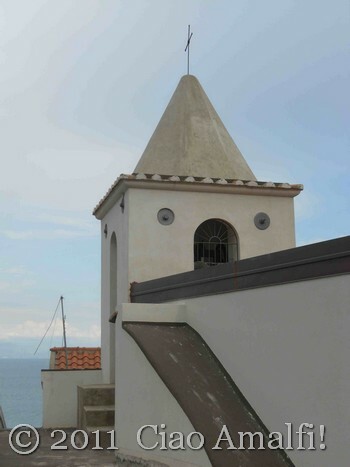 The procession of the statue of Sant’ Antonio (above) begins from the church near the Hotel Luna in Amalfi and follows the road through the tunnel to Atrani. The procession then makes its way through Atrani and down to the beach where the statue, religious procession AND the marching band are all loaded onto boats and continue for a boat procession from Atrani to Conca dei Marini to salute the church of Sant’ Antonio there before returning to Amalfi to continue the procession on land through Amalfi and back to the church. 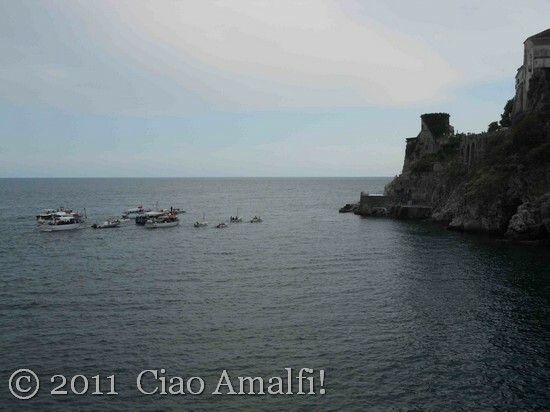 At night there is a large fireworks display over the harbor of Amalfi. 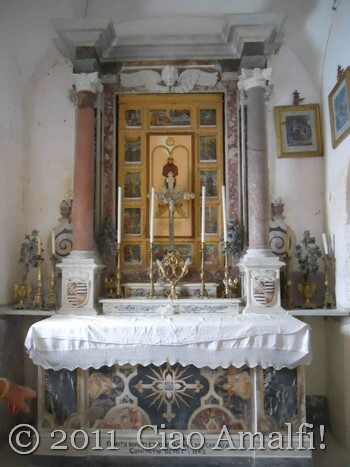 The hamlet of Pontone in Scala celebrates their patron saint San Giovanni Battista (St. John the Baptist) on June 24th. 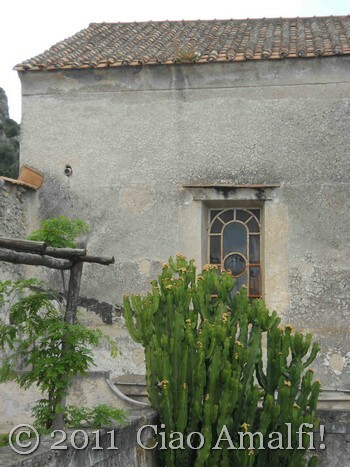 This is a wonderful chance to visit this pretty village set in the mountains between Amalfi and Scala. While the procession is small in scale compared to some of the other religious festivals in June, the pretty piazza at the center of the village is always decked out with lights and decorations. For me, the top religious festival of the summer is the Festival for Sant’ Andrea (St. Andrew), the patron saint and protector of Amalfi. The celebrations that take place on June 27th are in honor of a miracle that happened on June 27th, 1544 when Sant’ Andrea saved the town from an attack from pirates by stirring up a wild sea storm. 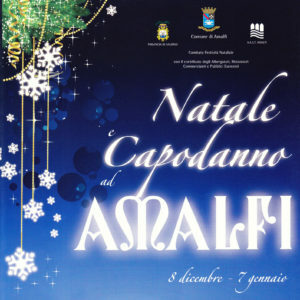 (If you’re visiting the Amalfi Coast off season, plan to come for the winter festival for Sant’ Andrea on November 30th.) The religious procession is solemn and beautiful. A large silver bust statue of Sant’ Andrea is carried down the steps of the Duomo of Amalfi, on a procession through the streets of town and down to the Marina Grande beach where a blessing is said to the harbor and boats (that blow their horns to celebrate!). The finale is worth waiting for … when the statue of Sant’ Andrea is run up the grand staircase of the Duomo! The fireworks display after dark is one of the largest of the summer. 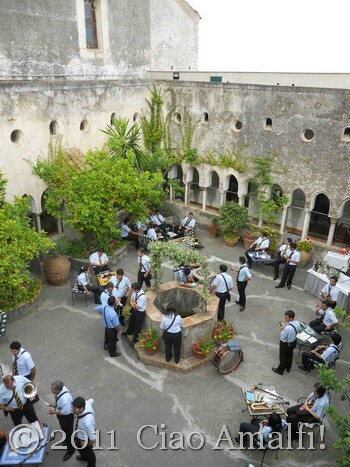 Just a few days after Sant’ Andrea in Amalfi, the Festival of San Pietro (St. Peter) takes place in Cetara. I experienced this big religious festival for the first time in 2010, and will be going back again each year. 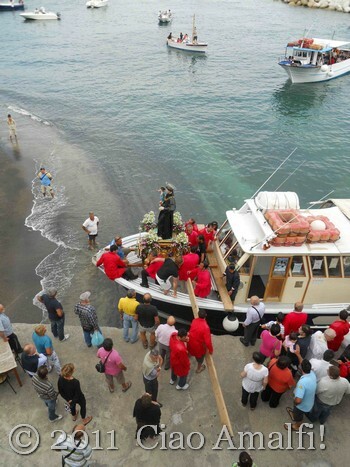 The procession of the statue of San Pietro standing on a boat decorated with flowers is carried through town on a long procession. With the strong fishing tradition in Cetara, I felt that this procession was still very deeply connected to the people of Cetara. When the procession reaches the beach, it is particularly beautiful against the lights of town and the medieval watchtower. 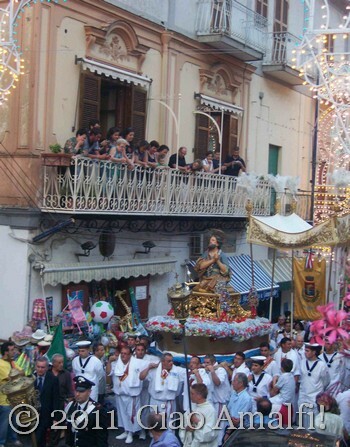 On July 13th, the town of Minori celebrates their patron saint Santa Trofimena during this summer festival. While I’ve experienced the winter celebrations for Santa Trofimena, I’ve not yet been to the summer celebrations. The church of Santa Trofimena in Minori is beautiful, and I’ve heard the procession is very moving. I hope to attend this summer! 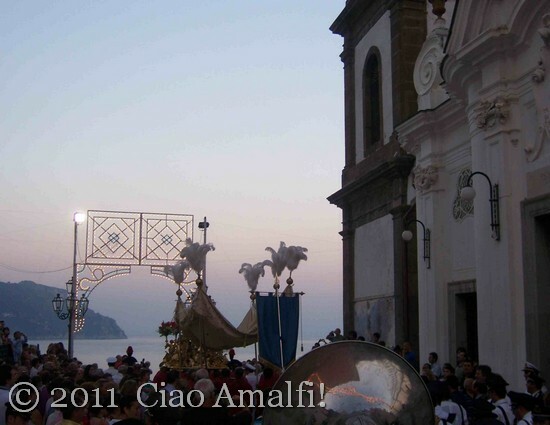 Right at the peak of lovely summer weather, the Festival of Santa Maria Maddalena (St. Mary Magdalene) in Atrani is a beautiful religious festival on the Amalfi Coast. The procession begins in the Collegiata dedicated to Santa Maria Maddalena, and continues through town and to the beach. After dark you’re in for a treat … a fireworks display from the sea that is fabulous from the beach! At the end of July, the town of Ravello takes their turn at celebrating in honor of their patron San Pantaleone (St. Pantaleon). The Piazza Duomo is filled to the brim, and the religious procession follows the narrow streets through town. After dark, a fireworks display is set off on the mountainside below the Piazza Duomo. For a wonderful view, head over to Scala and watch the fireworks with a view overlooking Ravello. The town of Scala is decorated with colorful lights by the first of August to celebrate Sant’ Alfonso de’ Liguori. Born near Naples in 1696, St. Alphonsus was very closely connected to the town of Scala, where he founded the Congregation of the Most Holy Redeemer. While a religious celebration takes place on August 1st, the decorations are also part of Scala’s celebration for their patron saint on August 10th. 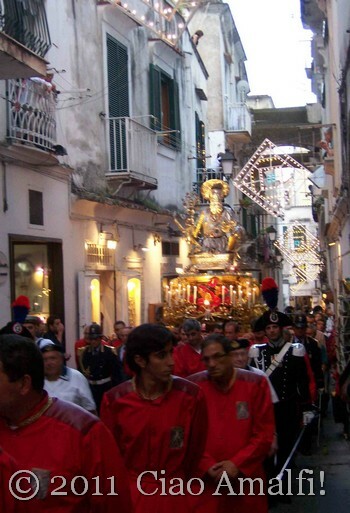 The biggest festival of the year in Scala takes place on August 10th in honor of San Lorenzo (St. Lawrence). The celebrations include a religious procession through town and a fireworks display after dark. This is an excellent opportunity to visit the beautiful Church of San Lorenzo in Scala when it is lit up and decorated for the festivities. Ferragosto is a holiday throughout Italy in honor of the Assumption of the Virgin Mary. 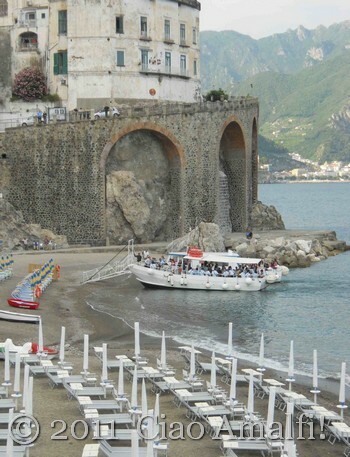 You’ll find beach parties and events taking place in most on the towns of the Amalfi Coast on August 15th. The celebrations are more elaborate and fun in Positano and Maiori, where the most important churches in both towns are dedicated to Santa Maria Assunta, or the Assumption of the Virgin. 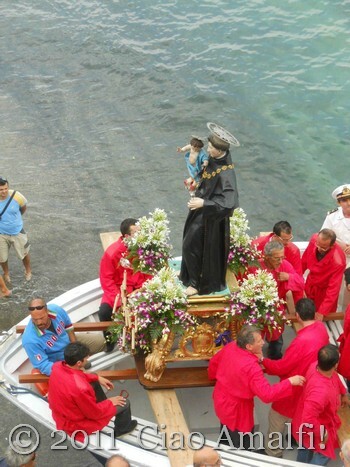 Positano’s celebrations take place starting on August 14th, and are especially vivid as the history of the arrival of the town’s famous icon of the Black Madonna is recreated. The fireworks displays in Positano and Maiori on August 15th are wonderful from the sea, and there are boat tours from Amalfi that will take you to see both of them. 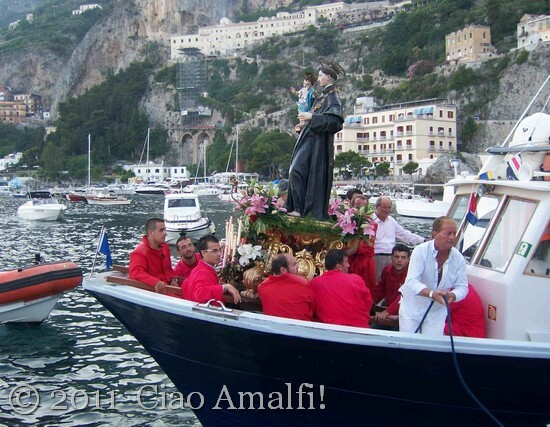 This is just a taste of some of the biggest summer religious festivals on the Amalfi Coast. There are many more! There are also many sagre (food festivals) and other summer festivals, but I’ll include those in another post. If you’ve experienced a summer religious festival that I’ve left out, please do leave a comment and I’ll add it to a list. Let the summer festivities begin! With 500 miles of coastline, three national parks and thousands of acres of olive trees, vineyards and citrus groves, Calabria is one of the most diverse regions in the bel paese. That diversity, combined with the enduring influence of Calabria’s past conquerors, notably the Greeks, Spaniards and Arabs, is echoed in Calabria’s unique cuisine. Join us, Cherrye Moore and Tania Pascuzzi, on our first annual tour through Calabria as we venture from table to table, introducing you to our local friends, chefs and cooks in the region. We have handpicked our favorite towns and villages, many of which you’d never find in a guidebook, so we can offer you a comprehensive, authentic culinary experience. 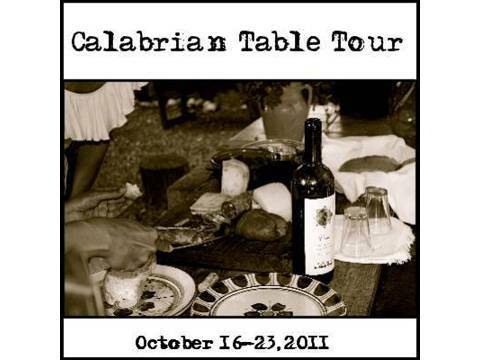 This Calabrian Table Tour is the first in a series of exclusive cooking, food and wine events that we will be offering twice a year. From Italy’s largest national park in the northern Calabria to the rugged coastline of the sun-kissed south, we have spent years eating our way through Calabria … and we want to share our Calabria with you, one table at a time. 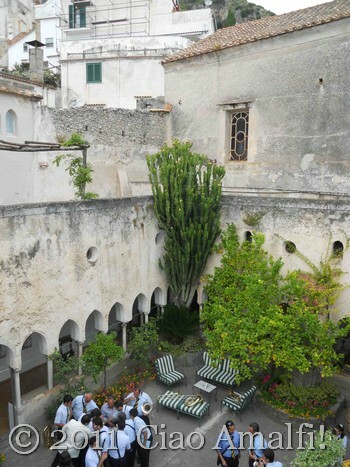 For more information, check out the Calabrian Table Tour itinerary and read more about the lovely ladies – Cherrye Moore and Tania Pascuzzi – who have created this delicious tour through the region of southern Italy they love. If you decide to join this fabulous tour, please do let me know, because I’ll want to hear all about it!